Videos : Dubnyk absolutely robs McDavid on the breakway with a huge glove save! Dubnyk absolutely robs McDavid on the breakway with a huge glove save! Even the Edmonton Oilers captain could not help but smile after this play. On Saturday night the National Hockey League hosted it's annual All Star Game and this time it once again featured 3 on 3 action with arguably the very best hockey players on the entire planet. The first match up of the evening was contested between the Pacific Division and the Central Division and unsurprisingly given the open nature of 3 on 3, the exhibition nature of the All Star Gamer, and the level of talent on display, we were treated to a number of highlight type plays on either end of the ice. One of the best moments of the night however came during the game's second period and it featured a duel between two of the National Hockey League's truly elite players, Edmonton Oilers superstar Connor McDavid and Minnesota Wild star goaltender Devan Dubnyk. There was roughly 6 minutes left in the game's second period when McDavid was the recipient of a beautiful pass from San Jose Sharks star defenseman Erik Karlsson , a pass that sent McDavid off on a breakaway, an opportunity that he does not often tend to miss. This time however the veteran Wild goaltender was more than up to the challenged and he stared down McDavid as arguably the best forward in the entire league closed in on him. McDavid tried to get fancy oh go up high above the glove of Dubnyk, but Dubnyk was having no part of that whatsoever and completely slammed the door shut on McDavid. As the Oilers captain tried to go up high Dubnyk flashed his glove, and probably added a little extra mustard for showmanship, snatching McDavid's shot out of mid air and drawing an audible gasp from the crowd. 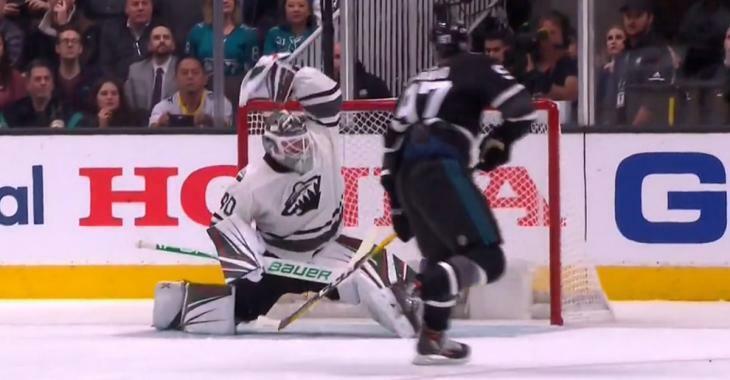 There was no question that the fans in attendance at the All Star Game in San Jose California were very impressed with the save as they not only gave Dubnyk a considerable cheer but even seemed to let out a long "Duuuuuub" chant as fans in Minnesota are known to do for their goaltender. Of course it's all in good fun so McDavid himself was able to appreciate the spectacular save from Dubnyk.